As the median age of Americans continues to age and as more Americans live with chronic medical conditions, the Department faces challenges in ensuring that beneficiaries who require nursing facility services receive high quality care. It is also critical to ensure that appropriate home- and community-based care is available, allowing beneficiaries whose needs and preferences are better served by remaining in their own homes or other community-based settings to avoid institutionalization. Nursing facility and home- and community-based services are important for individuals' well-being and can often prevent the need for acute inpatient hospitalizations. OIG work has uncovered various problems with nursing home care, including inadequate staffing, failure to provide adequate nutrition and hydration, inadequate wound care resulting in pressure wounds (bedsores), inappropriate medication practices, failure to develop adequate care plans, and excessive therapy services that are medically unnecessary or even harmful to beneficiaries. Medicaid is a major payer of personal care services, spending more than $12 billion annually. The Department is committed to ensuring that Medicaid beneficiaries enjoy adequate home- and community- based care options and as such, expenditures for personal care services may be expected to increase. Many Medicaid programs support beneficiary-directed models for the delivery of personal care services. While these systems offer certain advantages for promoting patient choice and preferences, OIG investigators have found such systems particularly vulnerable to fraud and abuse. The Department has taken steps to improve quality of nursing home and home- and community-based care. For example, the Department has initiated a review of the requirements for nursing homes to participate in the Medicare and Medicaid programs. This review promises to emphasize patient-centered care, quality improvement, and preventable rehospitalization. The Department has long recognized problems with patients cycling between nursing homes and acute care hospitals. As part of the Partnership for Patients Initiative, the Department specifically committed $300 million towards a Community-Based Care Transition Program to improve patient outcomes following hospital discharge. The Department has launched the National Nursing Home Quality Care Collaborative that proposes to identify best practices from high performing facilities and promote dissemination and replication of those practices to improve care. Increased involvement of Quality Improvement Organizations also offers potential improvement in quality of nursing home care. Through its Nursing Home Compare initiative, the Department also attempts to disseminate information about nursing home quality that may help inform beneficiaries and their families when selecting facilities. 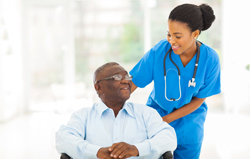 In 2013, CMS also released guidance that strengthens nursing home requirements in areas such as: the use of unnecessary medication, access and visitation, handling linens and infection control, and the provision of basic life support services for residents. OIG continues to pursue enforcement actions against nursing homes that render substandard care. CMS and OIG continue to work closely with law enforcement partners at the Department of Justice and through the Federal Elder Justice Interagency Working Group to promote better care for elderly persons and to prosecute providers that subject them to abuse or neglect. Additionally, State Medicaid Fraud Control Units (MFCUs), which receive oversight and funding from OIG, devote substantial resources to the investigation and prosecution of patient abuse and neglect in both Medicaid-funded facilities and board and care facilities. The President's FY 2014 Budget includes a legislative proposal to expand MFCU jurisdiction to review patient abuse and neglect in home- and-community based settings, as well. The decision to force a nursing home to shut down or stop serving Federal health care program beneficiaries is never taken lightly, as the experience of being transferred may be traumatic to displaced beneficiaries and locating nearby facilities to adequately serve them can be challenging. Therefore, OIG invests substantial efforts in helping facilities improve. OIG has developed an innovative quality-oriented corporate integrity agreement process to work with facilities so they may properly serve beneficiaries. OIG has placed more than 750 nursing homes under corporate integrity agreements that include quality-monitoring provisions designed to ensure that beneficiaries receive the care they deserve. Ensuring high quality home- and community-based services, enabling beneficiaries to avoid institutionalization, relies heavily on appropriate personal care services. In another promising initiative, the Department funded the National Direct Service Workforce Resource Center to develop the Road Map of Core Competencies for the Direct Service Workforce. A planned component of this initiative is to develop nationally validated core competencies for personal care service providers and reduce State variation. As OIG has previously noted, developing the standards will be a good first step, but getting States to adopt them may require more forceful action from the Department. The Department should continue to prioritize quality of nursing home and home- and community-based care. OIG has offered recommendations that can assist the Department in this mission. For example, OIG suggested enhancements to nursing home oversight to ensure that Medicare does not pay nursing homes to overmedicate or otherwise inappropriately medicate beneficiaries (See Challenge 3 for more information). The Department should also continue denying payments for services of such low quality that they are virtually worthless and work with OIG to exclude providers that have rendered grossly substandard care, thereby preventing additional harm to vulnerable beneficiaries. The Department should ensure integrity of Medicaid-funded personal care services by establishing minimum Federal qualification standards for providers, improving CMS's and States' ability to monitor billing and care quality, and issuing operational guidance for claims documentation, beneficiary assessments, plans of care, and supervision of attendants. The Department should also issue guidance to States regarding adequate prepayment controls and help States access data necessary to identify overpayments. CMS should continue developing and then implement its comprehensive action plan, including the input it gathered from the roundtable it held in April 2013 to consider feasible and effective practices for improving program integrity in personal care services.